The formation of granite plutons has conventionally been thought to be a slow process requiring millions of years from generation to cooling. Even though new mechanisms for rapid emplacement of plutons have now been proposed, radioisotope dating still dominates and dictates long timescales for pluton formation. However, a new challenge to those long timescales has arisen from radiohalos. Polonium radiohalos found in biotite flakes of granites in Yosemite National Park place severe time constraints on the formation and cooling of the granite plutons due to the short half-lives of the polonium isotopes. The biotite flakes must have formed and cooled below 150ºC before the polonium supply was exhausted and the radiohalos could be preserved, so the U decay had to be grossly accelerated and the formation of the plutons had to be within 6–10 days. Furthermore, rapid cooling of the plutons was facilitated by the hydrothermal fluid convection that rapidly generated the Po radiohalos, challenging conventional thinking that cooling is a slow process by conduction. 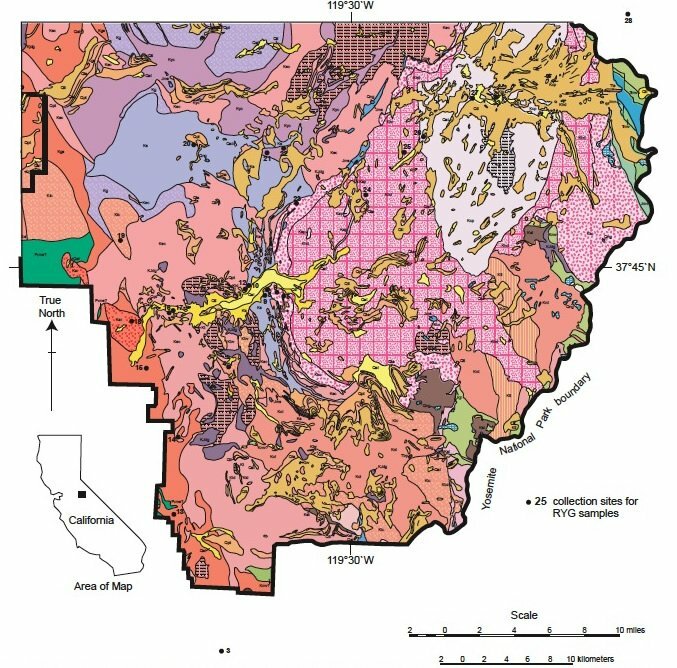 It is evident that there were greater volumes of hydrothermal fluids in the later central intrusions of the nested plutons of the Tuolumne Intrusive Suite. So as expected, more Po radiohalos were generated in these plutons as they were sequentially intruded, confirming the hydrothermal fluid transport model for Po radiohalo formation. Thus granite pluton formation is consistent with the timescale of a young earth, and accelerated radioisotope decay renders the absolute ages for these granite plutons grossly in error. 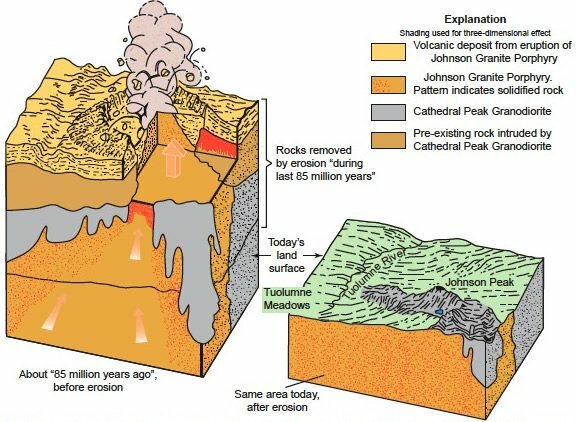 Keywords: Granite plutons, Yosemite National Park, Magma emplacement, Magma cooling, Polonium radiohalos, Hydrothermal fluids, Accelerated U decay, Nested plutons, Tuolumne Intrusive Suite, Sequential emplacement, Explosive volcanism. Granites constitute a major portion of the continental crust. They outcrop over many areas of the earth’s surface as discrete bodies called plutons, ranging in size from 10 km2 to thousands of km2. The granite magmas are believed to be sourced from great depths in the lower to mid levels of the continental crust, but the plutons crystallize in the upper crust, typically at depths of 1–5 km. Furthermore, granite plutons are often part of batholiths, which are regional areas comprised of hundreds of plutons. As far as can be ascertained, granite magmatism primarily occurs in the continental crust and involves four separate but potentially quantifiable stages—generation, segregation, ascent, and emplacement—that operate over length scales ranging from 10-5 to 106 meters (Petford et al. 2000). Once in place, the final stage is cooling. Explanations for the formation of even a single granite pluton have become somewhat controversial, even in the conventional geologic community, as once held conventions are being challenged. No longer is research focusing on just the mineralogy, geochemistry, and isotopes of granites as clues to their formation (which has hithertofore supposedly required long timescales of millions of years), but on the physical processes as well. The results of such research have drastically shortened the intrusion timescales of many plutons to just centuries and even months (Petford et al. 2000). Various evidences are now being cited that change the long-held, extended time frames for granite formation (Coleman, Gray, and Glazner 2004). Conventional thinking has been that plutons form from the slow rising of diapirs, large molten masses that intrude into the host rocks and then cool. However, the problem of how the host rocks provide the space for these intruding diapirs has been increasingly recognised. In contrast, there are field data that indicate persuasively that plutons have formed from small batches of magma that accumulated in succession by dike intrusions. 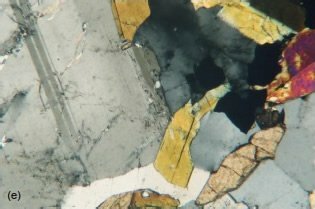 This new thinking drastically reduces the timescales for magma intrusion to form granite plutons, but most geologists are still convinced, based on their unerring commitment to radioisotope dating, that plutons require long uniformitarian time frames to form and then to cool primarily by conduction. Thus, the formation and the cooling of granite plutons are still regarded as prima facie evidences against the year-long, catastrophic global Flood on a young earth (Young and Stearley 2008). Granites are composed of several major minerals (quartz, K-feldspar, plagioclase, biotite, & hornblende), with minor constituents such as zircon (zirconium silicate). Tiny zircon grains (1–5 microns in diameter) are often found encased within large flakes (1–5 mm in diameter) of ubiquitous biotite. The zircon grains usually carry trace amounts of 238U, whose radioactive decay has provided a means by which it is claimed the ages of granites can be measured. Nevertheless, as the 238U in the zircon grains decays to 206Pb, it leaves physical evidence of that decay in the form of radiohalos, spherical zones of discoloration around these zircon grains (the radiocenters). Radiohalos are, in fact, the damage left by the emission of alpha (a) during the 238U decay process. The crystal structure of the surrounding biotite is damaged by the a-particles being “fired” in all directions like “bullets,” producing various concentric shells of darkening or discoloration (which are dark rings when viewed in cross-section). The radii of these concentric rings are related to the energies of the a-decay daughters in the 238U decay series (fig. 1b). 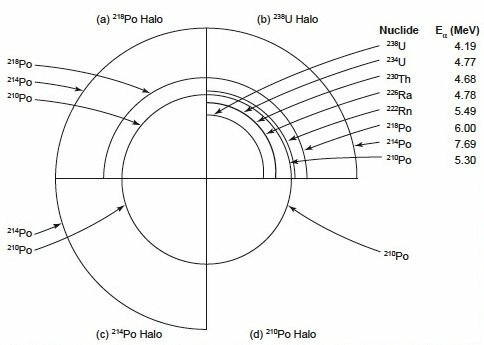 Of the different radiohalo types distinct from 238U (and 232Th), presently the only ones to be identified with known a-radioactivity are the Po (polonium) radiohalos (fig. 1a, c, d). There are three Po isotopes in the 238U-decay chain. In sequence they are 218Po (half-life of 3.1 minutes), 214Po (half-life of 164 microseconds), and 210Po (half-life of 138 days). Found also in fluorite and cordierite, these radiohalos could only have been produced by either the respective Po radioisotopes that then parented the subsequent a-decays, or by non- a-emitting parents (Gentry 1973, 1974). Because of the radiohalos being located along cleavages and cracks in fluorite grains and biotite flakes, secondary fluid transport processes are thought to have been responsible for supplying the required Po radioisotopes to the radiocentres. The reason for the attempts to account for the Po radiohalos by some secondary process is simple—the half-lifes of the respective Po isotopes are so short that the only alternative is the Po was primary, that is, the Po was independent of 238U originally in the granitic magmas which are supposed to have slowly cooled to form the granite plutons. However, there are obstacles to any secondary process. First, there is the problem of isotopic separation of the Po radioisotopes from their parent 238U having occurred naturally. Second, the concentration of Po necessary to produce a radiohalo is as high as 5 x 109 atoms (approximately 50% Po), and yet the host minerals contain only ppm abundances of U, which apparently means only a negligible supply of Po daughter atoms is available for capture in a radiocenter at any given time. Fig. 1. Composite schematic drawing of (a) a 218Po halo, (b) a 238U halo, (c) a 214Po halo, and (d) a 210Po halo, with radii proportional to the ranges of the a-particles in air. The nuclides responsible for the a-particles are listed for the different halo rings (after Gentry 1973). Therefore, there are strict time limits for the formation of the Po radiohalos by primary or secondary processes in granites. It was for this reason that Gentry (1974, 1986, 1988) proposed that the three different types of Po radiohalos in biotites resulted from the decay of primordial Po (original Po not derived by 238U decay), and thus claimed that the host granites also had to be primordial, that is produced by fiat creation. He thus perceived all granites to be Precambrian, and part of the earth’s crust created during the Creation Week. However, Wise (1989) documented that six of the 22 locations reported in the literature where Po radiohalos had been found were hosted by Phanerozoic granites which had been formed during the Flood. Additionally, many of the occurrences of Po radiohalos were in proximity to higher than normal U concentrations in nearby rocks and/or minerals, suggesting ideal sources for fluid separation and transport of the Po. Indeed, Snelling (2000) documented reports of 210Po as a detectable species in volcanic gases, in volcanic/hydrothermal fluids associated with subaerial volcanoes and fumaroles, and associated with mid-ocean ridge hydrothermal vent fluids and chimney deposits, as well as in groundwaters. The distances travelled by the Po in these fluids were up to several kilometres. Such evidence supports a viable secondary transport model for Po in hydrothermal fluids in granite plutons after their emplacement and during the waning stages of the crystallization and cooling of granite magmas (Snelling 2005a; Snelling and Armitage 2003; Snelling, Baumgardner, and Vardiman 2003). The prevailing view that plutons cool in less than a million years requires such conflicting ages to reflect the problems in isotopic systematics. However, it may be that many such age differences are real and that the problem lies instead with assumptions about plutonic processes. However, the existence of Po radiohalos in granite plutons supports the convention that plutonic processes occurred in very short time frames, so the problem has to be with the interpretation of the isotopic systematics, a concern echoed by Paterson and Tobisch (1992). Snelling (2005a), Snelling and Armitage (2003), and Snelling, Baumgardner, and Vardiman (2003) have proposed a model for the secondary transport of Po in hydrothermal fluids to form Po radiohalos during pluton cooling, so it needs to be recognized just how rapidly plutonic processes must have occurred. 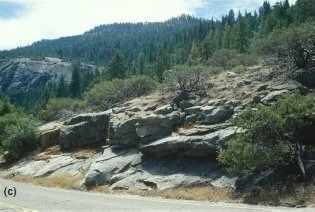 A classic location for the widespread outcropping of granites is in the Sierra Nevada of eastern Central California (fig. 2). Known as the Sierra Nevada Batholith, hundreds of granite plutons outcrop over an area of 40,000–45,000 km2. The batholith is conventionally of Mesozoic age, and lies along the western edge of the Paleozoic North American craton (Bateman 1992). It was emplaced in strongly deformed but weakly metamorphosed strata ranging in conventional age from Proterozoic to Cretaceous. To the east of the batholith in the White and Inyo Mountains, sedimentary rocks of Proterozoic and Paleozoic age crop out, and metamorphosed sedimentary volcanic rocks of Paleozoic and Mesozoic age crop out west of the batholith in the western metamorphic belt. The plutonic rocks of the batholith range in composition from gabbro to leucogranite, but tonalite, granodiorite, and granite are the most common rock types. Most of the plutons have been assigned to intrusive suites that appear to be spatially related to one another by being intruded sequentially and thus show regular age patterns. 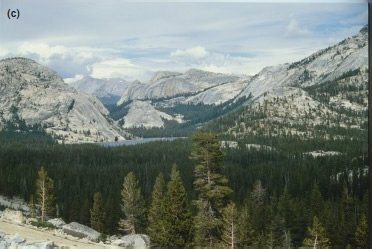 In the central Sierra Nevada are the spectacular granite outcrops of the Yosemite National Park (fig. studies on granites and the formation (Bateman 3), so these have been the focus of many previous 1992). This present study investigates the occurrence and distribution of U and Po radiohalos in the biotites of selected granite plutons in various, easily accessed outcrops in Yosemite National Park and shows how they provide evidence and support of the rapid formation of these granites. A particular focus was the set of nested plutons of the Tuolumne Intrusive Suite, which in contrast to the other granite plutons appear to have been intruded in a progressive sequence to form a very large zoned pluton. The generation of granite magmas and emplacement of granite plutons are still topics of debate among geologists today (Pitcher 1993). In recent years, a consensus has emerged that granite magmatism is a rapid, dynamic process operating at timescales of ≤100,000 years (Paterson and Tobisch 1992; Petford et al. 2000). Petford et al. (2000) state that research into the origin of granite has shifted away from geochemistry and isotopic studies towards understanding the physical processes involved. Heat advected into the lower crust from underlying hot mantle-derived basaltic magmas would rapidly and efficiently cause partial melting of crustal rocks, producing enough melt in 200 years or less to form a granite magma that can then be transported to the area of emplacement in the upper crust (Bergantz 1989; Huppert and Sparks 1988; Jackson, Cheadle, and Atherton 2003). Transport of the melt and magma (melt plus suspended solids) operates over two length scales (Miller, Watson, and Harrison 1988). First, segregation is small-scale movement of melt (centimeters to decimeters) within the source region. 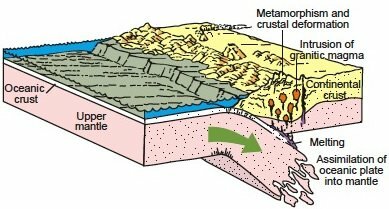 Second, once the melt is segregated, long-range (kilometer-scale) ascent of the magma through the continental crust to the site of final emplacement occurs. Crucial physical properties of a granite melt that facilitate its segregation are viscosity and density. Traditionally, granite melt has been thought to have a viscosity close to that of solid rock, but experimental studies have now demonstrated that the viscosity is a function of the composition, temperature and water content of the melt (Clemens and Petford 1999; Pitcher 1993). Fig. 2. Generalized geology of the Sierra Nevada and adjacent areas of eastern California, showing the location of the Yosemite National Park (after Bateman 1992). Deformation has been shown from field evidence to be the dominant mechanism that segregates and focuses granite melt flow in the lower crust, and this has been confirmed by rock deformation experiments (Brown and Rushmer 1997; Rutter and Neumann 1995). However, the proven efficiency of melt segregation by deformation makes it unlikely that large, granite magma chambers will form in the region of partial melting (Petford 1995; Petford and Koenders 1998). Instead, the most viable driving force for subsequent large-scale vertical transport of the melt through the continental crust is gravity. However, the traditional idea of buoyant granite magma ascending through the continental crust as slow-rising, hot diapirs or by stoping has been largely replaced. New models involving the ascent of granite magmas in narrow conduits, either as self-propagating dikes (Clemens and Mawer 1992; Clemens, Petford, and Mawer 1997; Petford 1995) along pre-existing faults (Petford, Kerr, and Lister 1993; Yoshinobu, Okaya, and Paterson 1998) or as an interconnected network of active shear zones and dilational structures (Collins and Sawyer 1996; D’Lemos, Brown, and Strachan 1993), are overcoming the severe thermal and mechanical problems associated with transporting very large volumes of magma through the upper brittle continental crust (Marsh 1982). A striking aspect of the ascent of granite melt in dikes compared to diapiric rise is the extreme difference in magma ascent rate between both processes, with the former up to a factor of 106 faster depending upon the viscosity of the material and conduit width (Clemens, Petford, and Mawer 1997; Petford, Kerr, and Lister 1993). In fact, field and experimental studies support the narrow dike widths (~1–50 m) and rapid ascent velocities predicted by fluid dynamical models (Brandon, Chacko, and Creaser 1996; Scalliet et al. 1994). Thus these dike ascent models have brought the timescale for granite magmatism more in line with that for large scale and volume catastrophic volcanism. Fig. 3. Scenic views in the Yosemite National Park. The total landscape is composed of many outcropping granite plutons that have intruded one another. The rate-limiting step in granite magmatism is the timescale of partial melting (Harris Vance, and Ayers 2000; Petford, Clemens, and Vigneresse 1997); the follow-on stages of segregation, ascent and emplacement can be geologically extremely rapid—perhaps even catastrophic. Once emplaced the magma must crystallize completely and cool to form the final granite pluton. Traditionally this process has been considered to have been primarily by conduction, thus taking millions of years. However, more recently, cooling models have increasingly incorporated convective cooling as the major component (Norton and Knight 1977; Parmentier 1981; Spera 1982; Torrance and Sheu 1978), and empirical studies (Brown 1987; Hardee 1982) have proved that thick igneous bodies do in fact cool primarily by circulating water (Snelling and Woodmorappe 1998). Thus, computer programs have been used to generate the most recent models for cooling plutons (Hayba and Ingebritsen 1997; Ingebritsen and Hayba 1994). Hydrothermal fluid circulation within a permeable or fractured country rock accounts for most heat loss when magma is emplaced into water-bearing country rock . . . Large hydrothermal systems tend to occur in the upper parts of the crust where meteoric water is more plentiful. Thus Snelling and Woodmorappe (1998) concluded that millions of years are not necessary for the cooling of large igneous bodies such as granite plutons. When radiohalos where first reported between 1880 and 1890, they remained a mystery until the discovery of radioactivity (Gentry 1973). Now they are recognized as any type of discolored radiation-damaged region within a mineral, resulting from the a-emissions from a central radioactive inclusion or radiocenter. Usually the radiohalos when viewed in rock thin sections appear as concentric rings that were initiated by the a-decay of 238U or 232Th series (Gentry 1973, 1974). Radiohalos are usually found in igneous rocks, most commonly in granitic rocks in which biotite is a major mineral. In fact, biotite is the major mineral in which the radiohalos occur. While observed mainly in Precambrian rocks (Gentry 1968, 1970, 1971; Henderson and Bateson 1934; Henderson, Mushkat, and Crawford 1934; Iimori and Yoshimura 1926; Joly 1917a, b, 1923, 1924; Kerr-Lawson 1927, 1928; Owen 1988; Wiman 1930), radiohalos have been shown to exist in rocks stretching from the Precambrian to the Tertiary (Holmes 1931; Snelling 2005a; Stark 1936; Wise 1989). Within the 238U decay series, the three Po isotopes have been the only a-emitters observed to form radiohalos other than 238U itself (fig. 1). These isotopes and their respective half-lifes are 218Po (3.1 minutes), 214Po (164 microseconds), and 210Po (138 days). Their very short half-lifes constrain the formation of the granites that they have been found in to a short time frame (Gentry 1986, 1988; Snelling 2000, 2005a), because the Po radiohalos can only form after the granites have crystallized and cooled, yet the Po isotopes are already in the granite magma when it is emplaced. Thus, if granite magma emplacement and pluton cooling are not extremely rapid, then these Po isotopes would not have survived to form the Po radiohalos (Snelling 2008a). This is consistent with, and in support of, a young earth model. As the rings for the Po precursors are usually missing (Snelling, Baumgardner, and Vardiman 2003), the source of the Po for the radiohalos has been an area of contention (Snelling 2000). Was it primary, or did a secondary process transport it? Gentry (1986) proposed that the Po radiohalos had been produced by primordial Po, having an origin independent of any U, so therefore, all granites and granitic rocks were formed by fiat creation during the Creation Week. In contrast, based on all the available evidence, Snelling (2000) suggested a possible model for transporting the Po via hydrothermal fluids during the latter stages of cooling of granite plutons to sites where the Po isotopes would have been precipitated and concentrated in radiocenters that then formed the respective Po radiohalos in the granites. Subsequently, Snelling and Armitage (2003) investigated the radiohalos in the biotite flakes within three granite plutons, demonstrating first that these granite plutons had been intruded and cooled during the Flood. 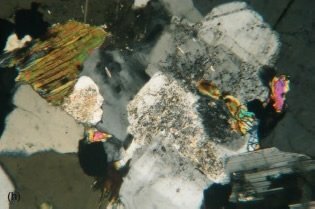 They found that the biotite grains contained both fully-formed 238U and 232Th radiohalos around zircon and monazite inclusions (radiocenters) respectively, thus providing a physical, integral, historical record of at least 100 million years worth (at today’s rates) of accelerated radioactive decay during the recent year-long Flood. 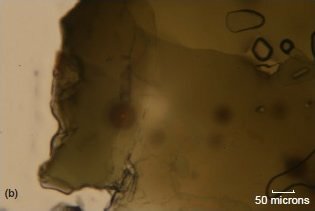 However, Po radiohalos were also often found in the same biotite flakes as the U radiohalos, usually less than 1 mm away. They thus argued that the source of the Po isotopes must have been the U in the zircon grains within the biotite flakes, the same zircon inclusions that are the radiocenters to the U radiohalos. Snelling and Armitage (2003) then went on to progressively reason the evidence that confirms the tentative model suggested by Snelling (2000). Because the precursor to 218Po is the inert gas 222Rn, after it is produced by 238U decay in the zircon grains it is capable of diffusing out of the zircon crystal lattice. Concurrently, as previously described, as the emplaced granite magma crystallizes and cools, the water dissolved in it is released below 400ºC so that hydrothermal fluids begin flowing around the constituent minerals and through the granite pluton, including along the cleavage planes within the biotite flakes. As argued by Snelling and Armitage (2003), and elaborated by Snelling (2005a), these hydrothermal fluids were capable of then transporting 222Rn (and its daughter Po isotopes) from the zircon inclusions to sites where new radiocenters were formed by Po isotopes precipitating in lattice imperfections containing rare ions of S, Se, Pb, halides or other species with a geochemical affinity for Po. Continued hydrothermal fluid transport of Po would have also replaced the Po in the radiocenters as it a-decayed to produce the Po radiohalos, thus progressively supplying the 5 x 109 Po atoms needed to form fully registered Po radiohalos. With further passing of time and more a-decays both the 238U and 210Po radiohalos are fully formed, the granite cools completely and hydrothermal fluid flow ceases. Note that both radiohalos have to form concurrently below 150ºC. The rate at which these processes occur must therefore be governed by the 138 day half-life of 210Po. To get 218Po and 214Po radiohalos these processes would have to have occurred even faster. Of course, if the U and Po radiohalos have both formed in a few days during the 6–10 days while the granite plutons cooled during the Flood, then this implies 100 million years worth of accelerated 238U decay occurred over a time frame of a few days. Thus the U-Pb isotopic systematics within the zircons in these granite plutons are definitely not providing absolute “ages” as conventionally interpreted. No other large batholith has offered conditions as favorable for geologic study as the Sierra Nevada Batholith, where exposures are good almost everywhere due to the glaciation in the high elevations (fig. 3) and the arid climate in the eastern escarpment (Bateman 1992). Before 1956, the batholith was considered a barrier to relating the stratified rocks in the western metamorphic belt to remnants within the batholith and to the strata east of the batholith in the Basin and Range Province, until plate tectonics provided a “solution,” due to the Sierra Nevada being considered to lie within the zone affected by Mesozoic and Cenozoic convergence of the North American plate with plates of the Pacific Ocean. The batholith is a segment of the Mesozoic batholiths that encircle the Pacific Basin. Systematic mapping of the region (fig. 2) by geologists of the U.S. Geological Survey grew out of independent studies of discrete areas or topics by individuals or small groups of individuals, and was completed at the 1:62,500 scale in 1982. The relevant quadrangle areas have also been combined into two comprehensive maps, one by Huber, Bateman, and Wahrhaftig (1989) covering the Yosemite National Park area and its surroundings (summarized in fig. 4), and the other by Bateman (1992) covering the belt across the batholith between latitudes 37º and 38ºN. Fig. 4. Geologic map of the southern and central Yosemite National Park (after Huber, Bateman, and Wahrhaftig 1989). The locations of the samples used in this study are indicated. The legend listing the chronologic sequence of mapped units is below. Those units sampled are indicated in bold. Studies of the individual plutons within the batholith have provided crucial contributions to the development of the model for rapid granite pluton formation discussed above. For example, Reid, Evans, and Fates (1983) studied magma mixing in granite rocks of the central Sierra Nevada and concluded that the intrusion of mafic magmas in the lower crust were important in the generation of the Sierra Nevada Batholith, having caused partial melting that generated granite magmas. These mafic and granite magmas then mixed during their emplacement, the evidence for this relationship being found in the El Capitan Granite and the Half Dome Granodiorite in the Yosemite National Park. Subsequently, Ratajeski, Glazner, and Miller (2001) concluded that the intrusion of the Yosemite Valley Suite involved two probably closely timed pulses of mafic-felsic magmatism. The first stage yielded the El Capitan Granite, mafic enclaves and the Rockslides diorite, while the second stage yielded the Taft Granite and a mafic dike swarm. A previous study by Kistler et al. 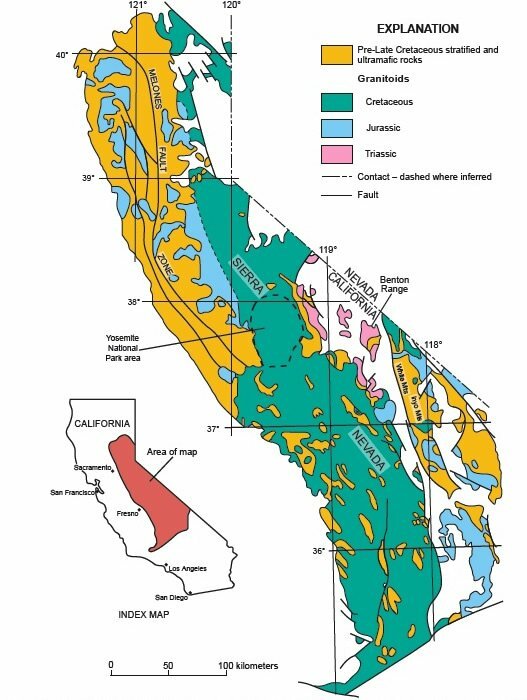 (1986) attributed the compositional zoning of the Tuolumne Intrusive Suite to the initial generation of a basalt magma in the lower continental crust. This basaltic magma then interacted with and melted some of the more siliceous and isotopically more radiogenic lower crust rocks to produce mixtures that were emplaced into the upper crust as the equigranular outer units of the suite. These studies thus confirm the role of mafic magmas in the rapid heating of the lower crust to rapidly form granite magmas. Various other studies have been done on the emplacement of the Sierra Nevada granite plutons. Paterson and Vernon (1995) applied the popular model for the emplacement of spherical granite plutons, that is, “ballooning” or in situ inflation of the magma chamber, to their studies of the Papoose Flat Pluton and the plutons of the Tuolumne Intrusive Suite. They concluded that many such plutons are better viewed as syntectonic nested diapirs, which implies that magma ascent may have occurred by the rise of large magma batches. Furthermore, normally zoned plutons may have thus formed by intrusion of several pulses of magma, rather than by in situ crystal fractionation from a single parent melt. Glazner et al. (2003) addressed the problem of making space for large batholiths such as the Sierra Nevada by suggesting that isostatic sinking of the growing magmatic pile into its substrate would have displaced the sub-batholithic crust toward the backarc region via large-scale intracrustal flow. They thus concluded that this may be the solution for the space problem, the crust beneath batholiths having been involved in lateral, large-scale, two- or three-dimensional intracrustal flow accompanied by thrust faulting. Hybrid viscoelastic models also offer realistic alternatives to end-member models (that is, dike versus diapir). More accurate models of pluton emplacement will allow better understanding of the construction of magmatic arcs, and ultimately how tectonics are manifested at plate boundaries. Studies of the evidence for how and when the plutons in the Sierra Nevada Batholith were emplaced are thus challenging previous conventional models and their associated timescales. For example, Coleman and Glazner (1997) considered the Sierra Nevada Batholith as a whole and concluded that during what they informally called the Sierra Crest magmatic event extremely voluminous magmatism resulted in rapid crustal growth. From approximately 98 to 86 Ma (a veritable instant in conventional geologic time) greater than 4000 km2 of exposed granodioritic to granitic crust was emplaced in eastern California to form about 50% of the Sierra Nevada Batholith, including the largest composite intrusive suites (such as the Tuolumne). Furthermore, although they comprise an insignificant volume of exposed rocks (less than 100 km2), mafic magmas were intruded contemporaneously with each episode of magmatism during this event, often mingling with the granite magmas during emplacement. Thus, the heat from these mantle-derived mafic magmas appears to have triggered this large-scale granite magmatic event. The Tuolumne Intrusive Suite (consisting of the Kuna Crest Granodiorite, Glen Aulin Tonalite, Half Dome Granodiorite, Cathedral Peak Granodiorite, and the Johnson Granite Porphyry) in the Yosemite National Park area has recently been used prominently as a prime example of the evidence that large and broadly homogenous plutons have accumulated incrementally supposedly over millions of years (Glazner et al., 2004). 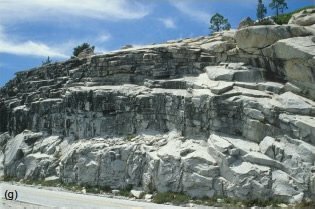 As previously discussed, a growing body of data suggests that many granite plutons were rapidly assembled as a series of sheet-like intrusions, while others preserve evidence that they were rapidly injected as a series of steep dikes. The Tuolumne Intrusive Suite of Yosemite National Park has long been thought to have crystallized from several large batches of magma that were emplaced in rapid succession (Bateman and Chappell 1979). Thus, Glazner et al. (2004) cited the abundant, unequivocal field evidence for the incremental dike emplacement of the plutons of the Tuolumne Intrusive Suite. 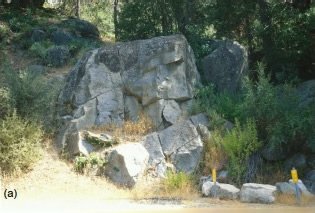 For example, in many places the outer margin of the Tuolumne is clearly composed of granodiorite dikes that invaded its wall-rocks. Furthermore, near its contact with the Glen Aulin Tonalite, the Half Dome Granodiorite contains sheets of varying composition and tabular swarms of mafic enclaves, but then grades inward to a more homogeneous rock. There in the Half Dome Granodiorite the occurrence of dikes or sheets is less certain, but they concluded that the textural homogeneity of large plutons like the Half Dome Granodiorite could also reflect the post-emplacement annealing of amalgamated dikes or sheets, and such a pluton thus might contain any number of cryptic contacts. This field evidence thus supports the model of Petford et al. (2000) for the incremental emplacement of very large zoned plutons such as the Tuolumne Intrusive Suite in less than 100,000 years. However, Glazner et al. (2004) state that the geochronologic data contradicts that timescale. In particular, U-Pb zircon data from the Tuolumne Intrusive Suite indicate that the plutons were assembled over a period of 10 m.y. between 95 and 85 Ma, with the oldest intrusions at the margins and the youngest at the center (Coleman and Glazner 1997; Coleman et al. 2004). The Half Dome Granodiorite evidently was intruded over a period of about 4 m.y., with older ages near the outer contact and younger ages near the inner contact, even though it has been mapped as a single continuous pluton. Nevertheless, Coleman, Gray, and Glazner (2004) admit that the apparent lateral age variations in the Tuolumne Intrusive Suite are not consistent with the field evidence for its emplacement as a series of small intrusions assembled incrementally as sheets or dikes through the entire suite, and not just its outer units where such evidence is so obvious. Furthermore, they state that when large plutons are dated multiple times by the zircon U-Pb method, it is fairly common for the resulting dates to disagree by more than the analytical errors. Bateman and Chappell (1979) reported on their comprehensive study of the concentric texturally and compositionally zoned plutonic sequence of the Tuolumne Intrusive Suite, in which they sought to develop and test a model for the origin of comagmatic plutonic sequences in the Sierra Nevada Batholith. Their study involved detailed petrologic and geochemical investigations of a large suite of samples in two traverses across the Tuolumne plutons. Modal, major oxide and trace element analyses, as well as some mineral analyses, were undertaken in order to characterize each of the plutons and quantify the mineralogical and compositional variations within and between them. Structural and textural variations were also described. They concluded that the compositional zoning within the suite indicated that with decreasing temperature the sequence solidified from the margins inward, with solidification being interrupted repeatedly by surges of fluid core magma. Bateman (1992) provided a comprehensive compilation of all the data from the studies of the Sierra Nevada Batholith up until that date, and this includes descriptions of all the plutons investigated in this current study. The Granodiorite of Kuna Crest (Kkc) (fig. 4) is dark gray and equigranular, with the average composition changing from quartz diorite to granodiorite. Its modal composition is quartz (15–22%), K-feldspar (9–15%), plagioclase (44–50%), biotite (10–12%), hornblende (7–13%), and sphene (0.5–1.0%) (Bateman and Chappell 1979). 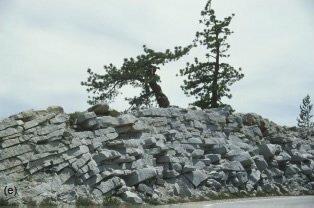 The Half Dome Granodiorite (Khd) is coarser grained than the Granodiorite of Kuna Crest (Kkc), and includes an outer equigranular facies and an inner megacrystic facies. 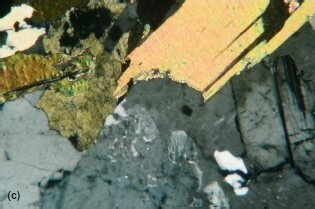 Hornblende (5 mm x 1.5 cm) and biotite (1 cm wide) crystals decrease in abundance inward, while plagioclase abundance remains constant, but both quartz and alkali (K)-feldspar abundances increase inward. Its modal composition is quartz (20–27%), K-feldspar (16–26%), plagioclase (39–51%), biotite (4–11%), hornblende (1–8%), and sphene (0.2–1.2%) (Bateman and Chappell 1979). The Cathedral Peak Granodiorite (Kcp) contains blocky alkali-feldspar megacrysts (commonly 3 cm x 5 cm), with the size and abundance of the megacrysts decreasing inward. Except for the inward decrease in abundance of these megacrysts and an absence of hornblende in the innermost parts, the modal composition of the Cathedral Peak Granodiorite is fairly constant, with quartz (24–30%), K-feldspar (20–28%), plagioclase (40–52%), biotite (1.3–4.5%), hornblende (0–2%), and sphene (0.1–0.7%) (Bateman and Chappell 1979). The Sentinel Granodiorite (Kse) (fig. 4) is equigranular and contains well-formed crystals of hornblende and biotite, and abundant wedgeshaped crystals of sphene. 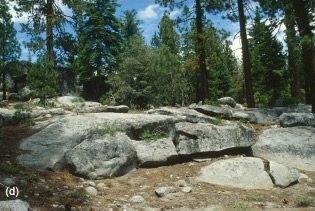 The Yosemite Creek Granodiorite (Kyc) is a dark-gray medium- to coarse-grained granitic rock of highly variable composition containing plagioclase phenocrysts. Both these plutons have sometimes been regarded as members of the Tuolumne Intrusive Suite, but are usually placed in the Intrusive Suite of Jack Main Canyon, or the Intrusive Suite of Sonora Pass by some workers. The Intrusive Suite of Yosemite Valley includes the El Capitan Granite and the Taft Granite, which have yielded U-Pb isotopic ages of about 102–103 Ma (Stern et al. 1981). The El Capitan Granite (Kec) (fig. 4) is a weakly to moderately megacrystic, leucocratic biotite granite. It is light gray, medium to coarse grained, and contains K-feldspar megacrysts (1–2 cm long) and small “books” of biotite. The Taft Granite (Kt) is medium-grained, very light gray, and on the Q-A-P diagram plots in the granite field. The Intrusive Suite of Washburn Lake, or of Buena Vista Crest according to some workers, includes the Granodiorite of Illilouette Creek (Kic) (fig. 4), which has yielded a discordant U-Pb age of 100 Ma (Stern et al. 1981). The Granodiorite of Illilouette Creek is the oldest, most mafic, and largest intrusion in this suite of plutons. It is dark, medium-grained, equigranular hornblende-biotite granodiorite and hornblende tonalite, with the combined hornblende and biotite content varying from 15% to 50%. Sparse euhedral crystals of hornblende are as long as 10 cm. The intrusive relationships between these plutons can be seen in Fig. 4. Bateman (1992) also reported that many of the biotite flakes found in the Sierra Nevada granite plutons contain tiny zircon crystals around which are “pleochroic halos,” another name for radiohalos. This observation had been previously made by Snetsinger (1967), who identified which mineral formed the nuclei (radiocenters) of the pleochroic halos in biotites in some of the Sierra Nevada granites. Because it was zircons that formed the radiocenters to those observed halos, they were undoubtedly 238U radiohalos. Each of the chosen granite plutons was sampled at the locations shown in Fig. 4. Access to the outcrops was available by road and by walking trails. 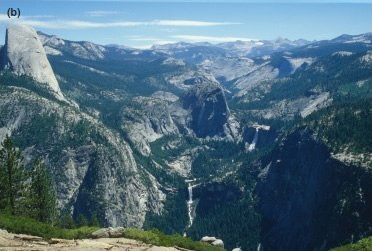 The samples were collected where the outcrops were freshest with the approval of the Yosemite National Park via the granting of a sampling and research permit. Some of the sampled outcrops are shown in Fig. 5. Fist-sized (1–2 kg) pieces of granite were collected at each location, the details of which were recorded using a Garmin GPS II Plus hand-held unit. Fig. 5. 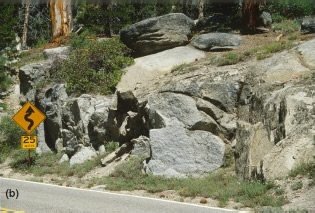 Outcrops of granites, many in road cuts, in the Yosemite National Park that were sampled for this study (for location details see fig. 4). A standard petrographic thin section was obtained for each sample. 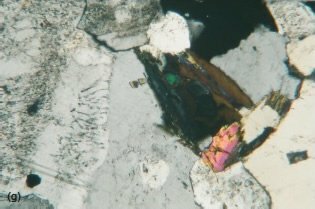 Photo-micrographs representative of some of these samples of the Yosemite granites as seen under the microscope are provided in Fig. 6. In the laboratory, portions of the samples were crushed to liberate the biotite grains. 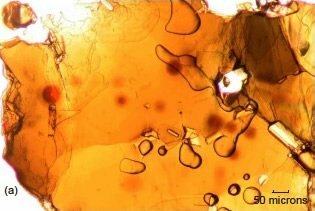 Biotite flakes were then handpicked with tweezers from each crushed sample and placed on the adhesive surface of a piece of Scotch tape™ fixed to the flat surface of a laminated board on a laboratory table with its adhesive side up. 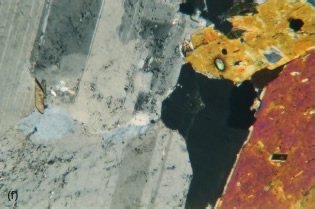 Once numerous biotite flakes had been mounted on the adhesive side of this piece of tape, a fresh piece of Scotch tape™ was placed over them and firmly pressed along its length so as to ensure the two pieces were stuck together with the biotite flakes firmly wedged between them. 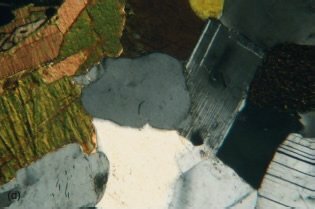 The upper piece of tape was then peeled back in order to pull apart the sheets composing the biotite flakes, and this piece of tape with thin biotite sheets adhering to it was then placed over a standard glass microscope slide so that the adhesive side and the thin mica flakes adhered to it. 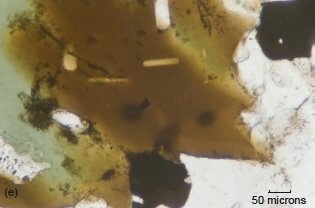 This procedure was repeated with another piece of Scotch tape™ placed over the original tape and biotite flakes affixed to the board, the adhering biotite flakes being progressively pulled apart and transferred to microscope sides. As necessary, further handpicked biotite flakes were added to replace those fully pulled apart. In this way tens of microscope slides were prepared for each sample, each with many (at least 20) thin biotite flakes mounted on it. This is similar to the method pioneered by Gentry (1988). A minimum of 50 microscope slides was prepared for each sample (at least 1,000 biotite flakes) to ensure good representative sampling statistics. Fig. 6. Photo-micrographs of some of the Yosemite granites used in this study, the locations of which are plotted on Fig. 4. All photo-micrographs are at the same scale (20× or 1 mm = 40µm) and the granites are as viewed under crossed polars. Each slide for each sample was then carefully examined under a petrological microscope in plane polarized light and all radiohalos present were identified, noting any relationships between the different radiohalo types and any unusual features. The numbers of each type of radiohalo in each slide were counted by progressively moving the slide backwards and forwards across the field of view, and the numbers for each slide were then tallied and tabulated for each sample. All results are listed in Table 1. Of the thirteen rock units sampled, four units had some samples yielding no radiohalos: the Granodiorite of Kuna Crest (two samples), the Sentinel Granodiorite (one sample), the Yosemite Creek Granodiorite (one sample), and the Tonalite of the Gateway (one sample). Nevertheless, all the granitic rock units sampled contained at least some radiohalos. In Table 1, the number of radiohalos per slide was calculated by adding up the total number of all radiohalos found in all samples of that particular rock unit, divided by the number of slides made and viewed for counting of radiohalos. The number of polonium radiohalos per slide was calculated in a similar way, except it was the total number of polonium radiohalos divided by the number of slides examined for that rock unit. And finally, the ratio in the last column was calculated by taking the number of 210Po radiohalos and dividing by the number of 238U halos. Photo-micrographs of some representative radiohalos are shown in Fig. 7. The 238U radiohalos in Fig. 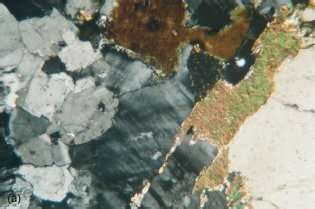 7a and b are “over exposed” meaning there has been so much rapid 238U decay that the resultant heavy discoloration of the biotite has blurred all the inner rings (compare with fig. 1). Often only holes remain in the centers of the 238U radiohalos where the tiny zirocn radiocenters have been lost during the peeling apart of the biotite flakes to tape them to the microscope slides in Fig. 7a (especially) other incomplete radiohalos stains can be been (lower right). These are due to this biotite sheet not cutting through the radiocenters of these (spherical) radiohalos. These stains likely represent four 210Po radiohalos and another 238U radiohalo, but only the visible complete radiohalos were recorded in Table 1. The outer ring of the 214Po radiohalo is very faint and see in these photo-micrographs. In Fig. 7d the single 210Po radiohalo is easily identified by its single outer ring about 39 µm (microns) in diameter. Note that its radiocenter is a hollow “bubble” where hydrothermal fluids deposited the 210Po atoms which then a-decayed to discolor the biotite and form the radiohalo. This feature is not so clearly seen in Fig. 7c, where the 210Po radiocenter is only about 100 µm from the nearly 238U radiocenter in the same biotite flake. The hydrothermal fluids thus did not have far to transport 222Rn and Po from the 238U radiocenter to form and supply the 210Po radiocenter within weeks so that the 238U and 210Po radiohalos formed concurrently. In Fig. 7e are three “over-exposed” 210Po radiohalos. This is indicative of there having been a lot of 210Po atoms in the radiocenters that then decayed. The diffuseness of the radiation damage is due to the large sizes of the radiocenters, which appear to now be empty “holes” that may originally have been fluid-filled “bubbles.” There are also remnants of much larger fluid inclusions in the same biotite flake. And finally, in Fig. 7f are three more diffuse 210Po radiohalos, as well as 210Po radiation staining around an elongated radiocenter that appears to have been a fluid inclusion. 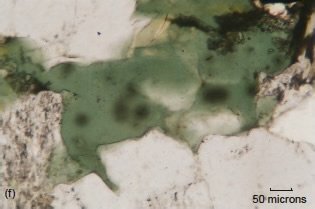 The other radiation stains in the same biotite flake represent radiohalos whose radiocenters are not in this plane of observation on this cleavage plane in this biotite flake. The data in Table 1 indicate that all these granitic rock units contain more 210Po radiohalos than 238U radiohalos (except the Sentinel Granodiorite which has equal numbers). There is also a wide range in the radiohalo abundances, from the Tonalite of the Gateway with only one 210Po radiohalo in two samples, and the Granodiorite of Kuna Crest with only five 210Po radiohalos and three 238U radiohalos (0.05 radiohalos per slide), to the Cathedral Peak Granodiorite with 325 210Po radiohalos and six 238U radiohalos (3.31 radiohalos per slide). Thus the ratio of the number of 210Po radiohalos to the number of 238U radiohalos varies from 1:1 in the Sentinel Granodiorite and 1.7:1 in the Granodiorite of Kuna Crest to 54:1 in the Cathedral Peak Granodiorite. The only rock units that contain other halos apart from 210Po and 238U halos are the Granite of Lee Vining Canyon and the Granodiorite of Arch Rock which both contain some 218Po halos, and the Half Dome Granodiorite with a single 214 halo. The results obtained for these Yosemite granites confirm the model for the formation of polonium radiohalos proposed by Snelling (2005a). Both 238U and 210Po radiohalos were found present together in the same biotite flakes in fourteen of the 25 samples studied. Because the thermal annealing temperature of radiohalos in biotite is 150ºC (Armitage and Back 1994; Laney and Laughlin 1981), the 238U and 210Po radiohalos in these biotite flakes had to have formed concurrently below that temperature. However, the short half-life of 210Po places a time constraint on the necessary conditions for the formation of the biotite flakes within the crystallizing and cooling granites and then the radiohalos of only 6–10 days or several weeks at most. The almost complete absence of 214Po and 218Po radiohalos implies both an insufficient supply of hydrothermal fluids and a slow rate of hydrothermal fluid transport, which restricted the formation of those radiohalos due to their very short half-lifes. It also implies that 222Rn was likely absent in the hydrothermal fluids. Therefore, Po was most likely transported as 210Po in the fluids to the nucleation sites where the 210Po radiohalos formed. Fig. 8 is a schematic conceptual temperature versus time cooling curve diagram which visualizes the timescale constraints on granite magma crystallization and cooling, hydrothermal fluid transport, and the formation of polonium radiohalos (Snelling 2008a). Granite magmas when intruded are at temperatures of 650–750ºC, and the hydrothermal fluids are released at temperatures of 370–410ºC after most of the granite and its constituent minerals have crystallized. However, the accessory zircon grains with their contained 238U crystallize very early at higher temperatures, and may have even been already formed in the magma when it was intruded. Thus the 238U decay producing Po isotopes had already begun well before the granite had fully crystallized, before the hydrothermal fluids had begun flowing, and before the crystallized granite had cooled to 150ºC. Furthermore, by the time the temperature of the granite and the hydrothermal fluids had cooled to 150ºC, the heat energy driving the hydrothermal fluid convection would have begun to wane and the vigor of the hydrothermal flow would also have begun to diminish (fig. 8). The obvious conclusion has to be that if the processes of magma intrusion, crystallization, and cooling required 100,000–1 million years, then so much Po would have already decayed and thus been lost from the hydrothermal fluids by the time the granite and fluids had cooled to 150ºC that there simply would not have been enough Po isotopes left to generate the Po radiohalos (Snelling, 2008a). Fig. 7. Photo-micrographs of representative radiohalos in Tuolumne Intrusive Suite granites. 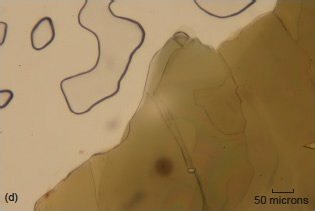 All the biotite grains are as viewed in plane polarized light, and the scale bars are all 50 µm (microns) long. 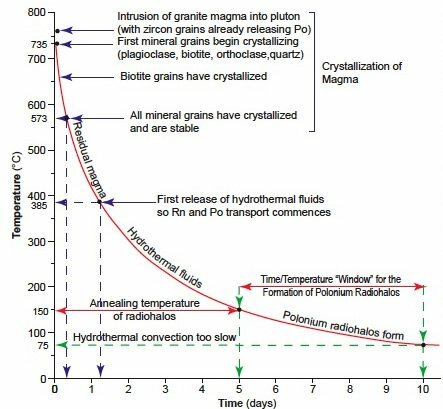 Both catastrophic granite formation (Snelling 2008a) and accelerated radioisotope decay (Vardiman, Snelling and Chaffin 2005) are relevant to the hydrothermal fluid transport model for Po radiohalo formation. However, halo formation itself provides constraints on the rates of both those processes (Snelling 2005a). If 238U in the zircon radiocenters supplied the concentrations of Po isotopes required to generate the Po radiohalos, the 238U and Po radiohalos must form over the same timescale of hours to days, as required by the Po isotopes’ short half-lifes. This requires 238U production of Po to be grossly accelerated. The 500 million–1 billion a-decays to generate each 238U radiohalo, equivalent to at least 100 million years’ worth of 238U decay at today’s decay rates, had to have taken place in hours to days to supply the required concentration of Po for producing an adjacent Po radiohalo. However, because accelerated 238U decay in the zircons would have been occurring as soon as the zircons crystallized in the magma at 650–750ºC, unless the granite magma fully crystallized and cooled to below 150ºC very rapidly, all the 238U in the zircons would have rapidly decayed away, as would have also the daughter Po isotopes, before the biotite flakes were cool enough for the 238U and Po radiohalos to form and survive without annealing. Furthermore, the hydrothermal fluid flows needed to transport the Po isotopes along the biotite cleavage planes from the zircons to the Po radiocenters are not long sustained, even in the conventional framework, but decrease rapidly due to cooling of the granite (Snelling 2008a). Thus Snelling (2005a) concluded from all these considerations that the granite intrusion, crystallization, and cooling processes occurred together over a timescale of only about 6–10 days. However, someone might inquire what requires the hydrothermal fluid flow interval to be so brief? Surely, because the zircon radiocenters and their 238U radiohalos are near to (typically within only 1 mm or so) the Po radiocenters in the same biotite flakes, could not the hydrothermal flow have indeed carried each Po atom from the 238U radiocenters to the Po radiocenters within minutes, but the interval of hydrothermal flow persist over many thousands of years during which the billion Po atoms needed for each Po radiohalo are transported that short distance? In this case the 238U decay and the generation of Po atoms could be stretched over that longer interval. However, as already noted above, by the time a granite body and its hydrothermal fluids cool to below 150ºC, most of the energy to drive the hydrothermal convection system and fluid flow has already dissipated (Snelling 2008a). The hydrothermal fluids are expelled from the crystallizing granite and start flowing at between 410 and 370ºC (fig. 8). So unless the granite cooled rapid from 400ºC to below 150ºC, most of the Po transported by the hydrothermal fluids would have been flushed out of the granite by the vigorous hydrothermal convective flows as they diminished. Simultaneously, much of the energy to drive these flows dissipates rapidly as the granite temperature drops. Thus, below 150ºC (when the Po radiohalos start forming) the hydrothermal fluids have slowed down to such an extent that they cannot sustain protracted flow. Moreover, the capacity of the hydrothermal fluids to carry dissolved Po decreases dramatically as the temperature becomes low. Fig. 8. Schematic, conceptual, temperature versus time cooling curve diagram to show the timescale for granite crystallization and cooling, hydrothermal fluid transport, and the formation of polonium radiohalos (after Snelling 2008a). Thus sufficient Po had to be transported quickly to the Po radiocenters to form the Po radiohalos while there was still enough energy at and below 150ºC to drive the hydrothermal fluid flow rapidly enough to get the Po isotopes to the deposition sites before they decayed. This is the time and temperature “window” depicted schematically in Fig. 8. It would, thus, simply be impossible for the Po radiohalos to form slowly over many thousands of years at today’s groundwater temperatures in cold granites. Hot hydrothermal fluids are needed to dissolve and carry the polonium atoms, and heat is needed to drive rapid hydrothermal convection to move Po transporting fluids fast enough to supply the Po radiocenters to generate the Po radiohalos. Furthermore, the required heat cannot be sustained for the 100 million years or more while sufficient 238U decays at today’s rates to produce the 500 million–1 billion Po atoms needed for each Po radiohalo. In summary, for there to be sufficient Po to produce a radiohalo after the granite has cooled to 150ºC, the timescales of the decay process as well as the cooling both must be on same order as the lifetimes of the Po isotopes. Thus, the hydrothermal fluid flow had to be rapid, as the convection system was shortlived while the granite crystallized and cooled rapidly within 6–10 days, and as it transported sufficient Po atoms to generate the Po radiohalos within hours to a few days. 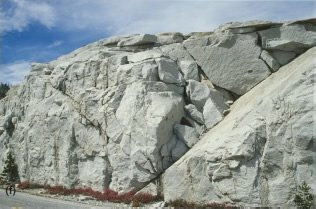 Formation of these granites, from emplacement to cooling, therefore had to have been on a timescale that previously has been considered impossible. Various studies have shown that emplacement of a melt is rapid via dikes and fractures assisted by the tectonics (Clemens and Mawer 1992; Coleman and Glazner 2004). Other studies have shown that cooling of the melt has been aided by hydrothermal fluids and groundwater flow (Brown 1987; Burnham 1997; Cathles 1977; Hardee 1982; Hayba and Ingebritsen 1997). Conventional thinking, that the formation of granite intrusions is a slow process over hundreds to thousands of years, is in need of drastic revision. The granites of Yosemite show that their formation had to be rapid in order for the radiohalos present in them to exist. 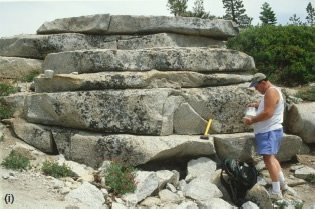 The four rock units of the Tuolumne Intrusive Suite of the Sierra Nevada Batholith display a pattern of Po radiohalos in which their numbers increase inwards within the suite according to the time sequence in which these units were progressively intruded. The first granite pluton intruded, the Granodiorite of Kuna Crest, only contains a few 210Po radiohalos, while there are progressively more 210Po radiohalos in the Half Dome Granodiorite, intruded next, and the Cathedral Peak Granodiorite and the Johnson Granite Porphyry, intruded last (table 1). This matches the pattern of Po radiohalos Snelling and Armitage (2003) observed in the zoned La Posta Pluton in the Peninsular Ranges Batholith east of San Diego, where there was also sequential intrusion of the granitic phases now making up that zoned pluton. Fig. 9 shows the sequence of intrusion within the Tuolumne Intrusive Suite. 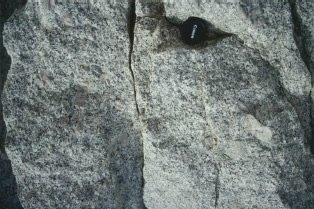 The last phase of these multiple intrusions, the Johnson Granite Porphyry, was also probably related and connected to volcanism at the surface (Huber 1989; Titus, Clark, and Rikoff 2005) (fig. 10). in narrow shear zones had rapidly metamorphosed the wall rocks, Po radiohalos were present in the resultant metamorphic rock, a type of metamorphic rock that otherwise does not host Po radiohalos (Snelling 2006). Fourth, where the hydrothermal fluids generated in the central granite at the highest grade within a regional metamorphic complex flowed and decreased outwards into that complex, the Po radiohalos numbers also progressively decreased outwards in the complex (Snelling 2008c). Fifth, in a granite pluton which has an atypically wide contact metamorphic and metasomatic aureole around it due to the high volume of hydrothermal fluids it released during its crystallization and cooling, Po radiohalos numbers are higher than in other granite plutons (Snelling 2008d). Thus, the significance of the increasing Po radiohalos numbers progressively inwards within this nested suite of plutons in the Tuolumne Intrusive Suite (table 1) according to the order in which they were intruded is the implication that there were progressively more hydrothermal fluids within each successive pluton. It is particularly evident from the much higher Po radiohalos numbers in the last two intrusive phases, the Cathedral Peak Granodiorite and the Johnson Granite Porphyry, that they sustained greater hydrothermal fluid volumes and flows. This increase in the hydrothermal fluids in the later stages of any intrusive sequence is due to the water released as the earlier intrusive phases crystallized and cooled building up in the later residual intrusive phases; particularly if the hydrothermal fluids are not readily escaping out into the surrounding host rocks. 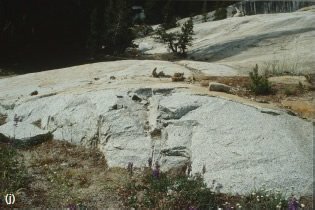 Whereas many other granite plutons intruded into sedimentary rocks containing connate and ground waters that assisted rapid granite cooling by convection cells being established outwards from the plutons (Snelling and Woodmorappe 1998), these Tuolumne plutons intruded into existing granite plutons, and then successively one another (fig. 9). Consequently, since granites have poor connective porosities and therefore poor permeabilities, the successively generated hydrothermal fluids would have been essentially “bottled up” in the later intrusive phases. Another “tell-tale” sign of the high volume of hydrothermal fluids that was in the Cathedral Peak Granodiorite is the large K-feldspar megacrysts which dominate its porphyritic texture. Magmatic hydrothermal fluids are known to have played a major role in their formation (Cox et al. 1996; Lee and Parsons 1997; Lee, Waldron and Parsons 1995). It was this continued build-up in the confined volume of hydrothermal fluids that also consequently explains why the last phase in this intrusive suite, the Johnson Granite Porphyry, was likely connected to explosive volcanism to the land surface above these cooling plutons (fig. 10). That large volumes of hydrothermal fluids were increasingly being confined to the inwards migrating hotter crystallizing core of the Cathedral Peak Granodiorite into which the Johnson Granite Porphyry intruded is evident from the observed inward decrease in the size and abundance of the K-feldspar megacrysts in the Cathedral Peak Granodiorite (Bateman and Chappell 1979). Indeed, the explosive volcanism would have released the confining pressure on the increasing volume of bottled-up hydrothermal fluids, the Johnson Granite Porphyry cooling from the residual pulse of magma that supplied the explosive volcanism (Huber 1989; Titus et al. 2005). Fig. 9. A map view of the sequential emplacement of the Tuolomne Intrusive Suite to form a set of nested plutons: nodiorite of Kune Crest, (b) (c) Half Dome Granodiorite, and (d) Cathedral Peak Granodiorite and Johnson Granite Porphyry (after Huber 1989). Since the Tuolumne Intrusive Suite is a nested set of plutons, there were severe constraints, due to the 150ºC thermal annealing temperature of the radiohalos, on the lapse of time between the intrusion of each phase of the suite. Each phase had to have been rapidly emplaced, crystallized and cooled sufficiently before the next phases were sequentially intruded, so that the entire suite of nested plutons was in place before the radiohalos began forming below 150ºC. Otherwise, the heat given off by each successively emplaced phase, which intruded its predecessors, would have annealed all radiohalos in them. That each phase had crystallized and cooled before the next phase was intruded has been confirmed by a recent study of the internal contacts within the suite (Zak and Paterson 2005). These are highly variable from relatively sharp, with no contact metamorphic effects from any major temperature differences between the earlier crystallized pluton and the subsequent intruding pluton, to gradational, the latter indicative of large scale mixing where the earlier (host) and subsequent (intruding) magmas must have both been crystallizing together. Coleman, Gray, and Glazner (2004) concluded that the successive development of the suite was a relatively rapidly emplaced series of small intrusions as possible sheets or dikes to incrementally assemble each pluton (or phase). However, so that annealing of the radiohalos would not occur above 150ºC, all the phases of the entire suite had to have intruded so rapidly that the entire suite cooled below 150ºC more or less at the same time. Furthermore, because of the short half-life of 210Po and the need for the hydrothermal fluids within the cooling granite masses to rapidly transport sufficient 210Po to supply the radiocenters to form the 210Po radiohalos before the 210Po decayed, the successive emplacement and cooling of the entire suite of nested plutons thus must have only taken several weeks. This survival of the Po radiohalos as a result of the rapid sequential emplacement of these nested plutons also implies that there could not have been a “heat problem” (Snelling 2005a). Whatever mechanisms dissipated the heat from these crystallizing and cooling magmas (Snelling 2008a; Snelling and Woodmorappe 1998) did so rapidly and efficiently without annealing the Po radiohalos in the surrounding earlier intruded phases of this nested suite of plutons. Thus this entire intrusive event, consisting of successive pulses of granite magma emplacement and cooling, must only have taken several weeks, culminating with a violent volcanic eruption. That would have finally dissipated the remaining heat by rapidly moving it to the earth’s atmosphere in steam and to the earth’s surface in the rhyolitic tuffs and lavas released by the eruption. Fig. 10. Final stages in the development of the nested plutons of the Tuolumne Intrusive Suite (after Huber 1989). The Johnson Granite Porphyry represents the final phase of the suite that intruded the Cathedral Peak Granodiorite and erupted through a volcanic caldera at the earth’s surface above, spewing volcanic ash and debris across it. The volcanic deposit and much of the underlying rock were subsequently removed by erosion to create today’s land surface. 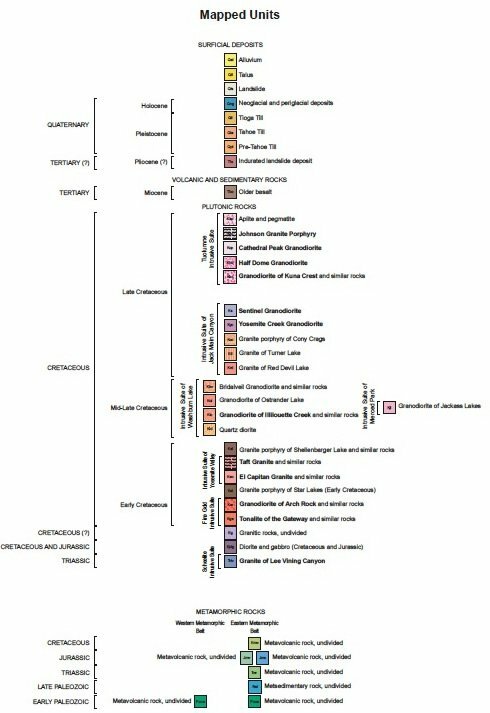 Finally, the formation of the hundreds of granitic plutons of the Sierra Nevada batholith, some of which outcrop on a grand and massive scale in the Yosemite area, can thus be adequately explained within the biblical framework for earth history. The regional geologic context suggests that late in the Flood year, after deposition of thick sequences of fossiliferous sedimentary strata, a subduction zone developed just to the west at the western edge of the North American plate (Huber 1989). Because plate movements were then catastrophic during the Flood year (Austin et al. 1994), as the cool Pacific plate was catastrophically subducted under the overriding North American plate the western edge region of the latter was deformed, resulting in buckling of its sedimentary strata and metamorphism at depth (fig. 11). The Pacific plate was also progressively heated as it was subducted, so that its upper side began to partially melt and thus produce large volumes of basalt magma. Rising into the lower continental crust of the deformed western edge of the North American plate, the heat from these basalt magmas in turn caused voluminous partial melting of this lower continental crust, generating buoyant granite magmas. These rapidly ascended via dikes into the upper crust, where they were emplaced rapidly and progressively as the hundreds of coalescing granite plutons that now form the Sierra Nevada batholith. The presence of polonium radiohalos in many of the Yosemite area granite plutons is confirmation of their rapid crystallization and cooling late in the closing phases of the Flood year. Conventional radioisotope dating, which assigns ages of 80–120 million years to these granites (Bateman 1992), is grossly in error because of not taking into account the acceleration of the nuclear decay (Vardiman et al 2005). Subsequent rapid erosion at the close of the Flood, as the waters drained rapidly off the continents, followed by further erosion early in the post-Flood era and during the post-Flood Ice Age, have exposed and shaped the outcropping of these granite plutons in the Yosemite area as seen today. Conventional thinking has been that granites in the continental crust have formed slowly over 105 to 106 years. In the last two decades though, evidence has accumulated to convince many geologists that granite pluton emplacement was a relatively rapid process over timescales of only years to tens of years. Dilation pressures in the deep crustal sources forced magma through fractures as dikes to feed rapidly shallow crustal magma chambers. Rapid cooling was aided by hydrothermal convection. Fig. 11. Subduction of an oceanic plate (Pacific plate) during convergence with a continental plate (North American plate). Magma, formed by partial melting of the overriding continental plate, rises into the upper continental plate to form granite plutons and volcanoes along a mountain chain (after Huber 1989). The evidence left by radiohalos found in Yosemite granites, however, further challenges the timescale of even this recent school of thought. The short half-lifes of polonium isotopes place severe time constraints on the formation and cooling of the biotite flakes containing the radiohalos produced by these polonium isotopes. 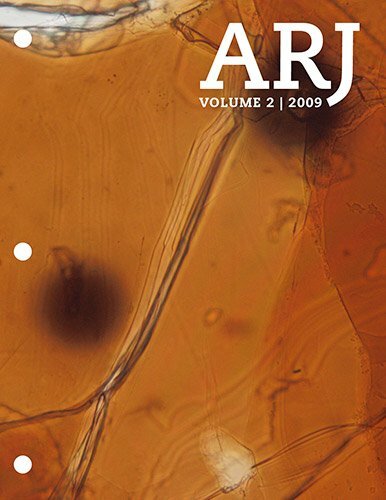 The hydrothermal fluids which were critical to the rapid cooling process also transported the 222Rn and polonium isotopes from U decay in zircon inclusions to generate the nearby polonium radiohalos within hours to days, once the granite’s temperature has fallen below 150ºC, the radiohalo annealing temperature. For the supply of 222Rn and Po isotopes to be maintained during the whole pluton formation process, so as to still generate the Po radiohalos, the U decay rate had to have been grossly accelerated, and the Yosemite granite plutons must have formed and cooled below 150ºC within six to ten days. This timescale, of course, is consistent with granite pluton formation within the young earth model. Furthermore, the acceleration of radioisotope decay means that absolute dates for rocks calculated on the assumption of decay having been constant are grossly in error. The nested plutons of the Tuolumne Intrusive Suite provide a test of the hydrothermal fluid transport model for the generation of Po radiohalos. The volume of hydrothermal fluids increased in each pluton as it was successively emplaced, so that the final magma at the center of the suite contained enough volatiles to feed a violent volcanic eruption at the earth’s surface. The model predicted the progressively greater volume of hydrothermal fluids would have generated more Po radiohalos in each successive pluton, and more Po radiohalos were indeed found. We would like to thank Dr. Larry Vardiman for his original suggestion to do this radiohalo study in Yosemite National Park, for help in collecting the rock samples, and for support of this research generally. Thanks to Mark Armitage for his help with some of the photomicrographs, and for processing some of the samples to obtain the radiohalos counts. Thanks to the Institute for Creation Research (ICR) for funding much of this project and for providing the equipment and facilities to do some of the research. Thanks to the National Parks Service for permission to collect the samples. And thanks also to Dallel’s parents and friends for their support and encouragement in her part of this study, which resulted in an M.S. dissertation in the ICR Graduate School. Ameglio, L. and J.-L. Vigneresse. 1999. Geophysical imaging of the shape of granitic intrusions at depth: A review. In Understanding granites: Integrating new and classical techniques, eds. A. Castro, C. Fernandez, and J.-L. Vigneresse, (special publication 168), pp. 39–54. London: Geological Society. Armitage, M. H. and E. Back. 1994. The thermal erasure of radiohalos in biotite. Creation Ex Nihilo Technical Journal 8(2):212–222. Austin, S. A., J. R. Baumgardner, D. R. Humphreys, A. A. Snelling, L. Vardiman, and K. P. Wise. 1994. Catastrophic plate tectonics: A global Flood model of earth history. In Proceedings of the third international conference on creationism, ed. R. E. Walsh, pp. 609–621. Pittsburgh, Pennsylvania: Creation Science Fellowship. Bateman, P. C. and B. W. Chappell. 1979. Crystallization, fractionation, and solidification of the Tuolumne Intrusive Series, Yosemite National Park, California. Geological Society of America Bulletin 90:465–482. Bateman, P. C. 1992. 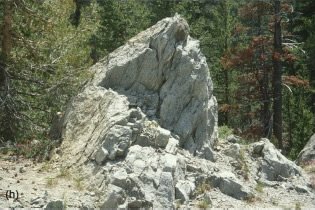 Plutonism in the central part of the Sierra Nevada Batholith, California. U.S. Geological Survey Professional Paper 1483, 185p. Bergantz, G. W. 1989. Underplating and partial melting: Implications for melt generation and extraction. Science 254:1039–1095. Bouchez, J. L., D. H. W. Hutton, and W. E. Stephens, eds. 1997. Granite: From segregation of melt to emplacement fabrics. Dordrecht, The Netherlands: Kluwer Academic Publishers. Brandon, A. D., T. Chacko, and R. A. Creaser. 1996. Constraints on rates of granitic magma transport from epidote dissolution kinetics. Science 271:1845–1848. Brown, M. and T. Rushmer. 1997. In Deformation-enhanced fluid transport in the earth’s crust and mantle, ed. M. Holness, pp.111–144. London: Chapman and Hall. Brown, S. R. 1987. 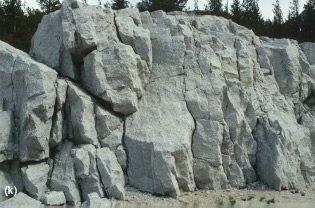 Fluid flow through rock joints: The effect of surface roughness. Journal of Geophysical Research 92:1337–1347. Burnham, C. W. 1997. Magmas and hydrothermal fluids. In Geochemistry of hydrothermal ore deposits, 3rd ed., ed. H. L. Barnes, pp. 63–123. New York: Wiley. Candela, P. A. 1991. Physics of aqueous phase evolution in plutonic environments. American Mineralogist 76:1081–1091. Cathles, L. M. 1977. An analysis of the cooling of intrusives by ground-water convection which includes boiling. Economic Geology 72:804–826. Clemens, J. D. and C. K. Mawer. 1992. Granitic magma transport by fracture propagation. Tectonophysics 204:339–360. Clemens, J. D., N. Petford, and C. K. Mawer. 1997. In Deformation-enhanced fluid transport in the earth’s crust and mantle, ed. M. Holness, pp. 145–172. London: Chapman and Hall. Clemens, J. D. and N. Petford. 1999. Granitic melt viscosity and silicic magma dynamics in contrasting tectonic settings. Journal of the Geological Society of London 156:1057–1060. Coleman, D. S. and A. F. Glazner. 1997. The Sierra Crest magmatic event: Rapid formation of juvenile crust during the Late Cretaceous in California. International Geology Review 39:768–787. Coleman, D. S., W. Gray, and A. F. Glazner. 2004. 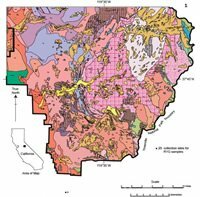 Rethinking the emplacement and evolution of zoned plutons: Geochronologic evidence for incremental assembly of the Tuolumne Intrusive Suite, California. Geology 32(5):433–436. Collins, W. J., and E. W. Sawyer. 1996. Pervasive granitoid magma transport through the lower-middle crust during non-coaxial compressional deformation. Journal of Metamorphic Geology 14:565–579. Cox, R. A., T. J. Dempster, B. R. Bell, and G. Rogers. 1996. 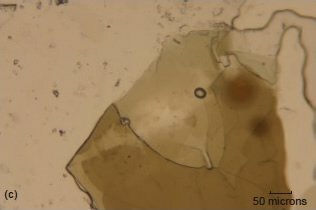 Crystallization of the Shap Granite: Evidence from zoned K-feldspar megacrysts. Journal of the Geological Society of London 153:625-635. D’Lemos, R. S., M. Brown, and R. A. Strachan. 1993. Granite magma generation, ascent and emplacement within a transpressional orogen. Journal of the Geological Society of London 149:487–490. Gentry, R. V. 1968. Fossil alpha-recoil analysis of certain variant radioactive halos. 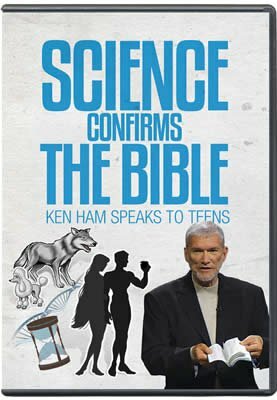 Science 160:1228–1230. Gentry, R. V. 1970. Giant radioactive halos: Indicators of unknown radioactivity. Science 169: 670–673. Gentry, R. V. 1971. Radiohalos: Some unique lead isotopic ratios and unknown alpha activity. Science 173:727–731. Gentry, R. V. 1973. Radioactive halos. Annual Review of Nuclear Science 23:347–362. Gentry, R. V. 1974. Radiohalos in a radiochronological and cosmological perspective. Science 184:62–66. Gentry, R. V. 1986. Radioactive halos: Implications for creation. In Proceedings of the first international conference on creationism, ed. R. E. Walsh, C. L. Brooks, and R. S. Crowell, vol. 2, pp. 89–100. Pittsburgh, Pennsylvania: Creation Science Fellowship. Gentry, R. V. 1988. Creation’s tiny mystery, 347 p. Knoxville, Tennessee: Earth Science Associates. Glazner, A. F., J. M. Bartley, W. B. Hamilton, and B. S. Carl. 2003. Making space for batholiths by extrusion of subbatholithic crust. International Geology Review 45:959–967. Glazner, A. F., J. M. Bartley, D. S. Coleman, W. Gray, and R. Z. Taylor. 2004. Are plutons assembled over millions of years by amalgamation from small magma chambers? GSA Today 14(4/5):4–11. Hardee, H. C. 1982. Permeable convection above magma bodies. Tectonophysics 84:179–195. Harris, N., D. Vance, and M. Ayres. 2000. 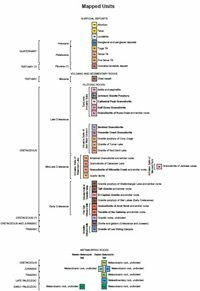 From sediment to granite: Timescales of anatexis in the upper crust. Chemical Geology 162:155–167. Hayba, D. O., and S. E. Ingebritsen. 1997. Multiphase groundwater flow near cooling plutons. Journal of Geophysical Research 102:12,235–12,252. Henderson, G. H., and S. Bateson. 1934. A quantitative study of pleochroic haloes—I. Proceedings of the Royal Society of London, Series A 145:563–581. Henderson, G. H., G. M. Mushkat, and D. P. Crawford. 1934. A quantitative study of pleochroic haloes—III Thorium. Proceedings of the Royal Society of London, Series A 158:199–211. Holmes, A. 1931. Radioactivity and geological time. In Physics of the earth—IV. The age of the earth. Bulletin of the National Research Council 80:124–460. Huber, H. K. 1989. The geologic story of Yosemite National Park. Yosemite National Park, California: The Yosemite Association. Huber, N. K., P. C. Bateman, and C. Wahrhaftig. 1989. Geologic map of Yosemite National Park and vicinity, California. U.S. Geological Survey Miscellaneous Investigations Series Map I-1874, 1 sheet, scale 1:125,000. Huppert, H. E., and R. S. J. Sparks. 1988. The generation of granitic magmas by intrusion of basalt into continental crust. Journal of Petrology 29:599–642. Hutton D. H. W. 1988. Granite emplacement mechanisms and tectonic controls: Inferences from deformation studies. Transactions of the Royal Society of Edinburgh. Earth Sciences 79:245–255. Hutton, D. H. W. 1992. Granite sheeted complexes: Evidence for the dyking ascent mechanism. Transactions of the Royal Society of Edinburgh. Earth Sciences 83:377–382. Iimori, S., and J. Yoshimura. 1926. Pleochroic halos in biotite: Probable existence of the independent origin of the actinium series. Scientific Papers of the Institute of Physical and Chemical Research 5(66):11–24. Ingebritsen, S. E., and D. O. Hayba. 1994. Fluid flow and heat transport near the critical point of H2O. Geophysical Research Letters 21:2199–2202. Jackson, M. D., M. J. Cheadle, and M. P. Atherton. 2003. Quantitative modeling of granitic melt generation and segregation in the continental crust. Journal of Geophysical Research 108(B7, ECV 3):1–21. Joly, J. 1917a. Radio-active halos. Philosophical Transactions of the Royal Society of London, Series A 217:51–79. Joly, J. 1917b. Radio-active halos. Nature 99:456–458, 476–478. Joly, J. 1923. Radio-active halos. Proceedings of the Royal Society of London, Series A 102: 682–705. Joly, J. 1924. The radioactivity of the rocks. Nature 114:160–164. Kerr-Lawson, D. E. 1927. Pleochroic haloes in biotite from near Murray Bay. University of Toronto Studies in Geology Series 24:54–71. Kerr-Lawson, D. E. 1928. Pleochroic haloes in biotite. University of Toronto Studies in Geology Series 27:15–27. Kistler, R. W., B. W. Chappell, D. L. Peck, and P. C. Bateman. 1986. Isotopic variation in the Tuolumne Intrusive Suite, central Sierra Nevada, California. Contributions to Mineralogy and Petrology 94:205–220. Laney, R., and A. W. Laughlin. 1981. Natural annealing of pleochroic haloes in biotite samples from deep drill holes, Fenton Hill, New Mexico. Geophysical Research Letters 8(5):501–504. Lee, M. R., and I. Parsons. 1997. 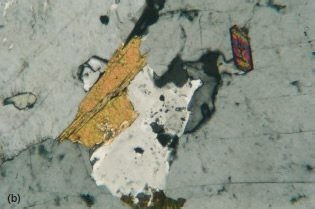 Dislocation formation and albitization in alkali feldspar from the Shap Granite. American Mineralogist 82:557–570. Lee, M. R., K. A. Waldron, and I. Parsons. 1995. Exsolution and alteration microtextures in alkali feldspar phenocrysts from the Shap Granite. Mineralogical Magazine 59:63–78. Mahan, K. H., J. M. Bartley, D. S. Coleman, A. F. Glazner, and B. S. Carl. 2003. Sheeted intrusion of the synkinematic McDoogle pluton, Sierra Nevada, California. Geological Society of America Bulletin 115(12):1570–1582. Marsh, B. D. 1982. On the mechanics of igneous diapirism, stoping and zone melting. American Journal of Science 282:808–855. McNulty, B. A., W. Tong, and O. T. Tobisch. 1996. Assembly of a dike-fed magma chamber: The Jackass Lakes pluton, central Sierra Nevada, California. Geological Society of America Bulletin 108(8):926–940. Miller, C. F., E. B. Watson, and T. M. Harrison. 1988. Perspectives on the source, segregation and transport of granitoid magmas. Transactions of the Royal Society of Edinburgh. Earth Sciences 79:135–156. Norton, D., and J. Knight. 1977. Transport phenomena in hydrothermal systems: Cooling plutons. American Journal of Science 277:937–981. Owen, M. R. 1988. Radiation-damaged halos in quartz. Geology 16:529–532. Parmentier, E. M. 1981. Numerical experiments on O18 depletion in igneous intrusions cooling by groundwater convection. Journal of Geophysical Research 86: 7131–7144. Paterson, S. R., and O. T. Tobisch. 1992. 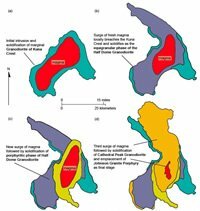 Rates of processes in magmatic arcs: Implications for the timing and nature of pluton emplacement and wall rock deformation. Journal of Structural Geology 14(3):291–300. Paterson, S. R., and R. H. Vernon. 1995. Bursting the bubble of ballooning plutons: A return to nested diapirs emplaced by multiple processes. Geological Society of America Bulletin 107(11):1356–1380. Petford, N. 1995. Segregation of tonalitic-trondhjemitic melts in the continental crust: The mantle connection. Journal of Geophysical Research 100:15,735–15,743. Petford, N., J. D. Clemens, and J.-L. Vigneresse. 1997. In Granite from segregation of melt to emplacement fabrics, eds. J.-L. Bouchez, D. H. W. Hutton, and W. E. Stephens, pp. 3–10. Dordretch: Kluwer. Petford, N., A. R. Cruden, K. J. W. McCaffrey, and J.-L. Vigneresse. 2000. Granite magma formation, transport and emplacement in the earth’s crust. Nature 408:669–673. Petford, N., R. C. Kerr, and J. R. Lister. 1993. Dike transport of granitoid magmas. Geology 21:845–848. Petford, N., and M. A. Koenders. 1998. Self-organisation and fracture connectivity in rapidly heated continental crust. Journal of Structural Geology 20:1425–1434. Pitcher, W. S. 1993. The nature and origin of granite, 321p. London: Blackie Academic and Professional. Ratajeski, K., A. F. Glazner, and B. Miller. 2001. Geology and geochemistry of mafic to felsic plutonic rocks in the Cretaceous Intrusive Suite of Yosemite Valley, California. Geological Society of America Bulletin 113(11):1486–1502. Reid, J. B. Jr., O. C. Evans, and D. G. Fates. 1983. Magma mixing in granitic rocks of the central Sierra Nevada, California. Earth and Planetary Science Letters 66:243–261. Rutter, E. H., and D. H. K. Neumann. 1995. Experimental deformation of partially molten Westerly Granite under fluid-absent conditions, with implications for the extraction of granitic magmas. Journal of Geophysical Research 100:15,697–15,715. Scalliet, B., A. Pecher, P. Rochette, and M. Champenois. 1994. The Gangotri Granite (Garhwal Himalaya): Laccolith emplacement in an extending collisional belt. Journal of Geophysical Research 100:585–607. Snelling, A. A. 2000. Radiohalos. In Radioisotopes and the age of the earth: A young-earth creationist research initiative, eds. L. Vardiman, A. A. Snelling, and E. F. Chaffin, pp. 381–468. El Cajon, California: Institute for Creation Research; St. Joseph, Missouri: Creation Research Society. Snelling, A. A. 2005a. Radiohalos in granites: Evidence for accelerated nuclear decay. In Radioisotopes and the age of the earth: Results of a young-earth creationist research initiative, eds. L. Vardiman, A. A. Snelling, and E. F. Chaffin, pp. 101–207. El Cajon, California: Institute for Creation Research; Chino Valley, Arizona: Creation Research Society. Snelling, A. A. 2005b. Polonium radiohalos: The model for their formation tested and verified. Impact #386. El Cajon, California: Institute for Creation Research. Snelling, A. A. 2006. Confirmation of rapid metamorphism of rocks. Impact #392. El Cajon, California: Institute for Creation Research. Snelling, A. A. 2008b. Testing the hydrothermal fluid transport model for polonium radiohalo formation: The Thunderhead Sandstone, Great Smoky Mountains, Tennessee–North Carolina. Answers Research Journal 1:53–54. Snelling, A. A. 2008c. Radiohalos in the Cooma Metamorphic Complex, New South Wales, Australia: The mode and rate of regional metamorphism. In Proceedings of the sixth international conference on creationism, ed. A. A. Snelling, pp. 371–387. Pittsburgh, Pennsylvania: Creation Science Fellowship; Dallas, Texas: Institute for Creation Research. Snelling, A. A. 2008d. Radiohalos in the Shap Granite, Lake District, England: Evidence that removes objections to Flood geology. In Proceedings of the sixth international conference on creationism, ed. A. A. Snelling, pp. 389–405. Pittsburgh, Pennsylvania; Creation Science Fellowship, and Dallas, Texas: Institute for Creation Research. Snelling, A. A. 2009. Radiohalos in the Mole Granite, New South Wales, Australia, in contrast to other granites in the New England Batholith: A potential correlation with hydrothermal ore veins. In preparation. Snelling, A. A., and M. H. Armitage. 2003. Radiohalos—A tale of three granitic plutons. In Proceedings of the fifth international conference on creationism, ed. R. L. Ivey, Jr., pp. 243–267. Pittsburgh, Pennsylvania: Creation Science Fellowship. Snelling, A. A., J. R. Baumgardner, and L. Vardiman. 2003. Abundant Po radiohalos in Phanerozoic granites and timescale implications for their formation. EOS, Transactions of the American Geophysical Union 84(46), Fall Meeting Supplement, Abstract V32C–1046. Snelling, A. A. and J. Woodmorappe. 1998. The cooling of thick igneous bodies on a young earth. In Proceedings of the fourth international conference on creationism, ed. R. E. Walsh, pp. 527–545. Pittsburgh, Pennsylvania: Creation Science Fellowship. Snetsinger, K. G. 1967. Nuclei of pleochroic halos in biotites of some Sierra Nevada granitic rocks. American Mineralogist 52:1901–1903. Spera, F. J. 1982. Thermal evolution of plutons: A parameterized approach. Science 207:299–301. Stark, M. 1936. Pleochroitische (Radioaktive) Höfe ihre Verbreitung in den Gesteinen und Veränderlickheit. Chemie der Erde 10:566–630. Stern, T. W., P. C. Bateman, B. A. Morgan, M. F. Newell, and D. L. Peck. 1981. Isotopic U-Pb ages of zircons from the granitoids of the central Sierra Nevada. U.S. Geological Survey Professional Paper 1185, 17p. Titus, S. J., R. Clark, and B. Rikoff. 2005. Geologic and geophysical investigation of two fine-grained granites, Sierra Nevada Batholith, California: Evidence for structural control on emplacement and volcanism. Geological Society of America Bulletin 117:1256–1271. Torrance, K. E., and J. P. Sheu. 1978. Heat transfer from plutons undergoing hydrothermal cooling and thermal cracking. Numerical Heat Transfer 1:147–161. Vardiman, L., A. A. Snelling, and E. F. Chaffin, eds. 2005. Radioisotopes and the age of the earth: Results of a youngearth creationist research initiative. El Cajon, California: Institute for Creation Research; Chino Valley, Arizona: Creation Research Society. Wiman, E. 1930. Studies of some Archaean rocks in the neighbourhood of Uppsala, Sweden, and their geological position. Bulletin of the Geological Institute, University of Uppsala 23:1–170. Wise, K. P. 1989. Radioactive halos: Geological concerns. Creation Research Society Quarterly 25:171–176. Yoshinobu, A. S., D. A. Okaya, and S. R. Paterson. 1998. 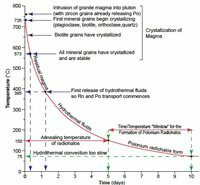 Modeling the thermal evolution of fault-controlled magma emplacement models: Implications for the solidification of granitoid plutons. Journal of Structural Geology 20(9–10):1205–1218. Young, D. A., and R. F. Stearley. 2008. The Bible, rocks and time: Geological evidence for the age of the earth. Downers Grove, Illinois: InterVarsity Press. Zak, J., and S. R. Paterson. 2005. Characteristics of internal contacts in the Tuolumne Batholith, central Sierra Nevada, California (USA): Implications for episodic emplacement and physical processes in a continental arc magma chamber. Geological Society of America Bulletin 117:1242–1255. Zhao, J., and E. T. Brown. 1992. Thermal cracking induced by water flow through joints in heated granite. International Journal of Rock Mechanics 17:77–82.